The land of Bengal gave us a great atist. 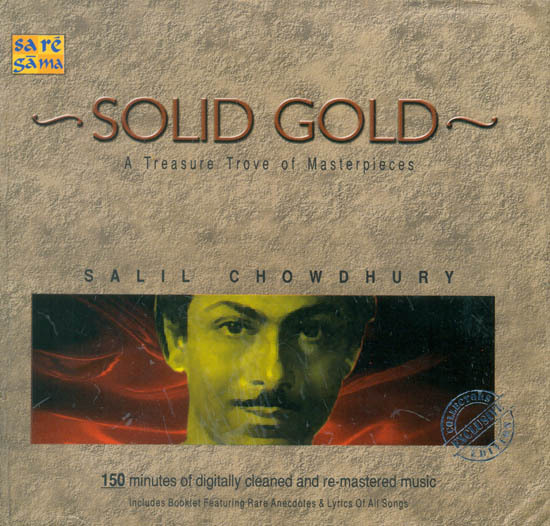 Salil Chowdhury. A music director, a poet, a writer, a dramatist and a freedom fighter all rolled into one. This man had various facets to his personality as well as his music. Salil was born in Sonapur, Parganas, and his father Gyanendra Chowdhury was a doctor who had a deep interest in music. His brother was the director of an orchestra called “Milan Parishad”. Thus Salil was surrounded by music throughout his childhood. This contributed to the genesis of his musical disposition. Salil learnt to play the piano and violin and was introduced both to Indian classical music as well as Western classical music, thus he developed a style influenced by the two. He could also play the sarod, guitar and the flute. Nevertheless the flute remained his favorite instrument and he has used it in many of his compositions. Salil started using his gift in his student days to protest against the British rule. He wrote the Bengali songs “Bicharpati Tomar Bichar” in 1943, and “Dheu Uthchhe Kara Tutchhe” in 1944 for the Quit India Movement, both of which were banned. His songs expressed his anti-colonial feelings, his love for the people of his country and the poor and oppressed landless peasants, his songs were revolutionary. After the independence, his lyrics very often expressed his deep feelings about the social injustice and the unfairness present in our society. Sahil founded the Gana Natya or Indian Peoples Theatre Association (IPTA), where he composed innumerable songs under the grouping “Ghum Bhangar Gaan”. Among these included musical accompaniments to famous poems such as Sukanta Bhattacharya’s” Abak Prithibi” and “Runner”. Other famous “mass songs” (ganasangit) from this period include “Hei Samalo” written for the Tebagha Andolan (1948),” Amaar Pratibader Bhasha” (1950) and other translations of mass songs from around the world, particulary the Soviet Union. He was also, with Ruma Guha Thakurta, a founder of the Calcutta Youth Choir, which traveled in its early years around the villages of Bengal with the IPTA to sing Sail Chaudhury’s songs. His fame spread far and wide. Salil’s first Hindi film was “Do Bigha Zamin”, which was the Hindi version of Salil’s Bengali film script “Rikshawalaa”. He wrote it at the invitation of Bimal Roy. People from the industry had heard so much about his composing style that during the recording of the song “Dharti Kahe Pukar Ke”, from the same movie, many musicians had gathered to watch him work. His use of choral voices to create harmony and counterpoints was innovative and fantastic. This was the signature style of Salil Chowdhury. Salil then composed for many films “Madhumati”, “Musafir”, “Awaaz”, “Anand”, “Half-Ticket” and “Rajnigandha”. The list goes on. Since Sahil was a poet as well, he needed to imbibe the poetic content of the lyrics so that he could create a tune which correctly expresses the particular sentiment. This can be seen in his songs “Zindagi Kaisi Hai Paheli Hai” and “Kahin Door Jab Din Dhaal Jaye” from Anand which convey the bittersweet irony of life and love through their lyrics as well as their profound and touching tunes. Salil shared a unique rapport with lyricist Shailendra and to some extent with Rajendra Krishan and Yogesh. He and Shailendra have worked together in many films to create unforgettable songs. It was he who had cajoled Salil to compose “Aaja, re pardesi” for “Madhumati”, based on a piece of music he had used in the climax of “Jagte Raho/Ekdin Raatre” against the wishes of Bimal Roy. Salil was an exceptional writer, though his forte was writing in the Bengali Language, he has written stories for the films “Pinjre Ki Panchhi”, “Parakh” and “Minoo” and also the Kannad film “Chinna Ninna Muddaduwe”. He also wrote several short stories, plays and poems. In 1983 his only album of his poems was released. He recites his poems with background music composed by him. Salil was a creative genius and had an artistic temperament. Sometimes he would spend days on end without food or sleep in critical examination of one of his compositions, before deciding how the tune should be developed. There is also a visual aspect in Salil’s music. One can virtually see the song. A number like “Aaha, Rimjhim Ke Yeh Pyaare-Pyaare Geet Liye” from the film “Usne Kaha Tha” Paints the picture of pouring rain. The use of mandolin in the prelude, of the violin ensemble in the first and third antras, and of the swaying voices of Lata Mangeshkar and Talat Mahmood in the second antara and the grand finale after the third antara, all create a feel of the physicality of rain as absorbed by our senses. Salil’s baton was his paintbrush, musical instruments his colours and films his canvas. So let’s close our eyes and be transported to different realms of music, experience heady sensations and let our hearts feel each and every tune of Salil Chowdhury’s treasured collection.